Text won't fill box. HELP! GIMP Forums / GIMP / General / Text won't fill box. HELP! When I create a text box and begin entering text, the text will fill about 1/3 of the box before moving to the next line. I've tried changing every setting I can find, scoured the internet for days, restarted GIMP, restarted my computer, and renamed the image. It makes no sense. RE: Text won't fill box. HELP! Reinstalling rarely does any good. Better to use Edit -> Preferences -> Tool Options -> Reset and start from fresh. First thing to try is the Text box mode. Fixed will wrap the text. Drag the handles to resize. Dynamic is one long line until you 'enter' to make a line break or drag the box handles which turns it into fixed mode. You can change back in the tool options. (May 23, 2014 16:13)ofnuts Wrote: Is the problem independent of the font used? What OS and Gimp version are you using? Can you post a screenshot of the Tool options dialog when the text tool is active? I've tried all of those things. I need to be able to used fixed rather than dynamic. (May 23, 2014 16:18)rich2005 Wrote: Reinstalling rarely does any good. Better to use Edit -> Preferences -> Tool Options -> Reset and start from fresh. Quote: ...I need to be able to used fixed rather than dynamic. That might well be the case but is there any difference using dynamic with hard line breaks? Good thought about Unity, but I just tried with GNOME and had no luck. Let me clarify on the dynamic/fixed: yes, I could use dynamic, but the problem isn't just that the letters won't fill the whole box. There's also the issue of the letters being much narrower than they should. I've been doing a little more experimentation, and I'm convinced that the issue is linked to specific images (but I don't know what property would cause it or how to change it). It appears to me that the letters are appearing about 1/3 of their normal width and that they fill about 1/3 of a fixed box before starting a new line, which leads me to believe that they are visually incorrect, but that GIMP is understanding them to be their normal width. If they were at their normal width, they would fill the entire box. Am I making sense? (May 27, 2014 17:27)drbrickhouse Wrote: I've been doing a little more experimentation, and I'm convinced that the issue is linked to specific images (but I don't know what property would cause it or how to change it). Yep that makes sense but I can not offer a solution You show the Sans font which should be bog standard in linux. Does the text convert to a path with the same effect? ie. too narrow. Had a look around without coming up with much. I would check that you have the freetype, freetype2 packages installed. I saw one report of them missing in a 'buntu. Might be worth asking the question in an Ubuntu forum. Then click the different options under "Hinting" in the font/text "Tool options"
Does this make the font normalized/more bolder? This is probably the cause. The canvas is made with different horizontal and vertical resolutions. File -> New -> Advanced -> x/y resolution. 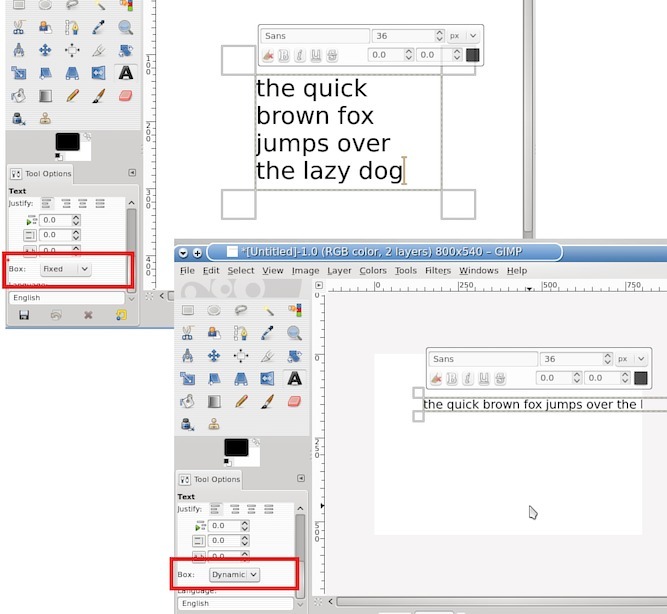 This example, the text is rendered 'compressed' while a path-from-text shows how the text should appear. Same thing just happened to me and it does seem to be specific to the image. For a workaround I created a new image and made the textbox the size I wanted, filled it in and then saved it as an xcf file. Then I closed it, opened the image where I needed the text and added the text image that I made as a new layer, and deleted the background layer of the text. Then all I had to do was move the text layer to the position where I wanted it.